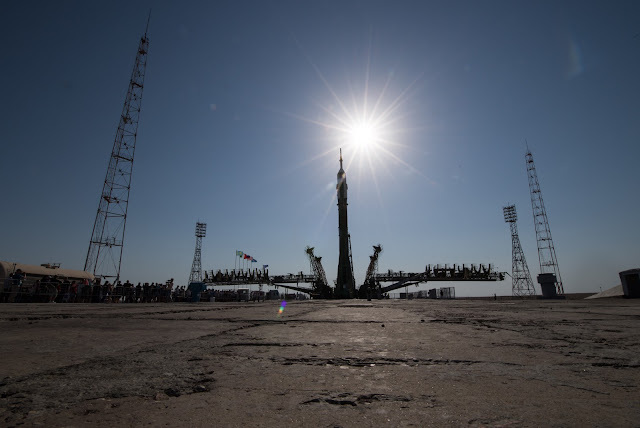 July 26, 2017: The Soyuz MS-05 spacecraft is seen as it is raised into a vertical position on the launch pad at the Baikonur Cosmodrome, Kazakhstan, Wednesday, July 26, 2017. Expedition 52 flight engineer Sergei Ryazanskiy of Roscosmos, flight engineer Randy Bresnik of NASA, and flight engineer Paolo Nespoli of ESA (European Space Agency), are scheduled to launch to the International Space Station aboard the Soyuz spacecraft from the Baikonur Cosmodrome on Friday, July 28, at 11:41 a.m. EDT (9:41 p.m. Baikonur time). The Fireworks Galaxy | Happy July 4th! Happy 150th Birthday, Canada! Happy Canada Day!